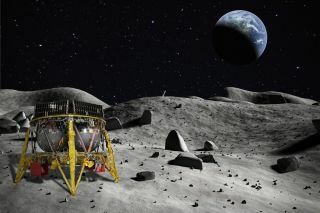 Artist's illustration of Israel's Beresheet lander on the moon. The spacecraft is scheduled to touch down on April 11, 2019. "Though the Google Lunar X Prize went unclaimed, we are thrilled to have stimulated a diversity of teams from around the world to pursue their ambitious lunar missions, and we are proud to be able to recognize SpaceIL's accomplishment with this Moonshot Award," X Prize CEO Anousheh Ansari said in the same statement. This may not be a one-off for the X Prize Foundation. The organization will consider granting other such awards in the future, "recognizing both literal and figurative moonshots," X Prize representatives said in the same statement. The 5-foot-tall (1.5 m) Beresheet, whose name means "in the beginning" in Hebrew, launched to Earth orbit on Feb. 21 atop a SpaceX Falcon 9 rocket. The lander has performed several engine firings over the past five weeks to push its orbit closer to the moon. Beresheet remains on course to be captured into lunar orbit on April 4 and to touch down a week later, mission team members have said. SpaceIL's craft will gather some data on and around the moon. But the mission's chief objectives are to advance Israel's space program and to inspire young people around the world to care more about science, technology, engineering and math. Among the lander's payloads are an Israeli flag and a "time capsule" that includes a 30-million-page archive of human history and culture. This "lunar library" was provided by the Arch Mission Foundation, which aims to back up humanity's accumulated knowledge by storing records of it in various off-Earth locales.